Thank you for taking part in Language and Literacy within the Curriculum. Here you can find relevant materials from the training to support you throughout the project and with your ongoing work. 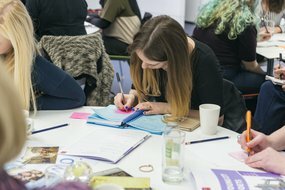 You don't need to prepare anything before attending the first session, but please ensure you have access to the National Literacy Trust membership and the resources listed here, as you will need these to complete your project. If you have not received these please contact schools@literacytrust.org.uk. Please spend some time completing the gap tasks you were given at the end of each session. You will find these in the relevant folders listed here. Don't forget, in addition to the resources provided, you can also use the additional resources made available you as part of your involvement with the project. Congratulations on completing your project. If your membership started at the time of your training you will be able to access resources for up to a year from your start date - at which point you can renew. If your school already had membership, you can check your expiry date on your dashboard. If you have any issues please contact membership@literacytrust.org.uk. We love to hear how you have got on with your project and help celebrate your success, and if you would like to write a case study for us you can gain access to our 'working with the National Literacy Trust' logo. Find out more.